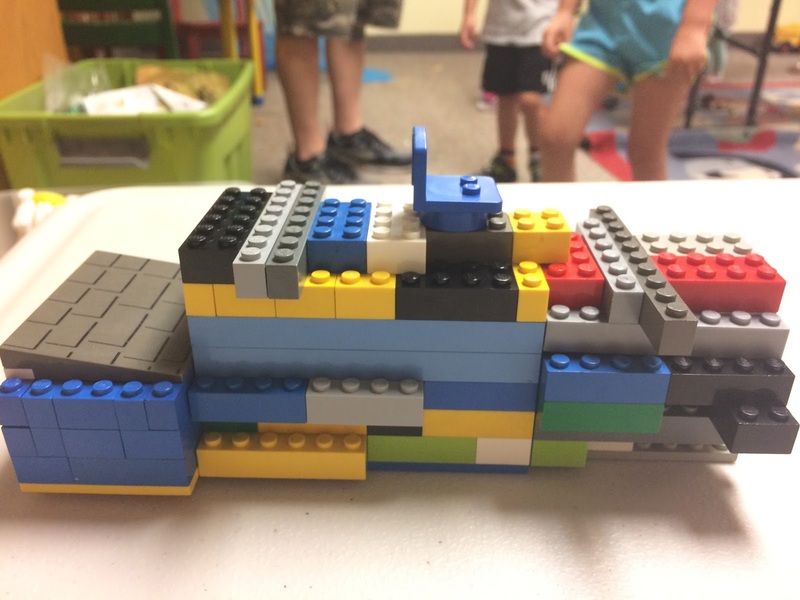 Update from the Children’s Room! 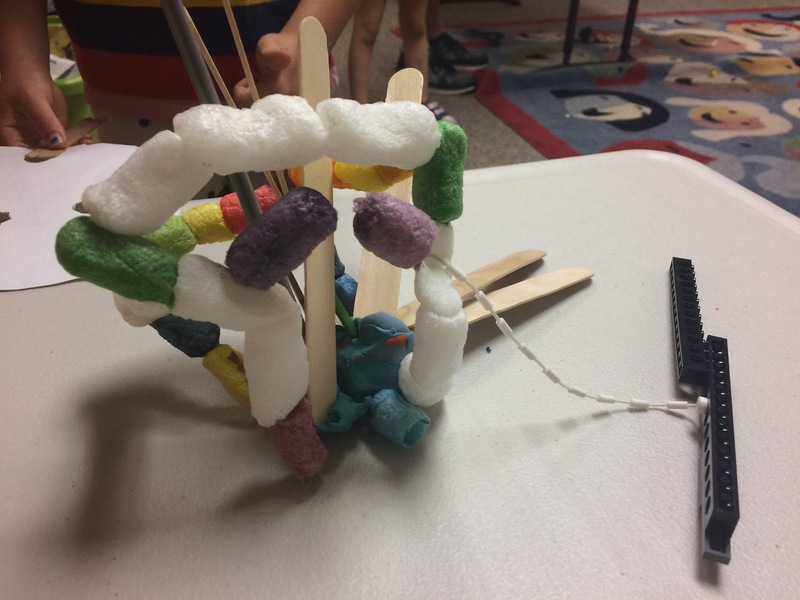 In honor of this year’s theme for the national summer reading program, Build A Better World, Miss Shannon and I decided to curate a schedule of activities and events for our calendar that all feature a focus on STEAM; that is, Science, Technology, Engineering, Art, and Math. One such program that we ran yesterday, to much success, was Enchanted Engineering. 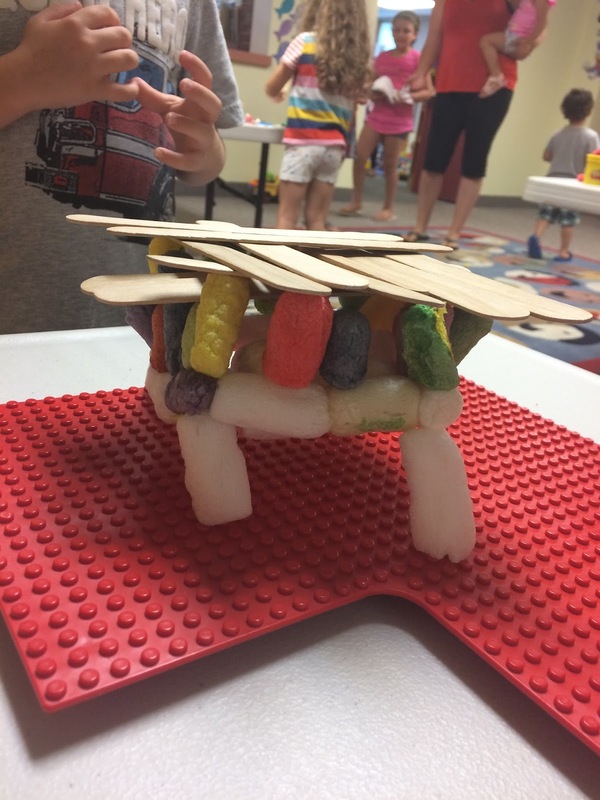 In this program, our youngest patrons were tasked with helping the Three Little Pigs build a house strong enough to withstand the respiratory force of the Big Bad Wolf. 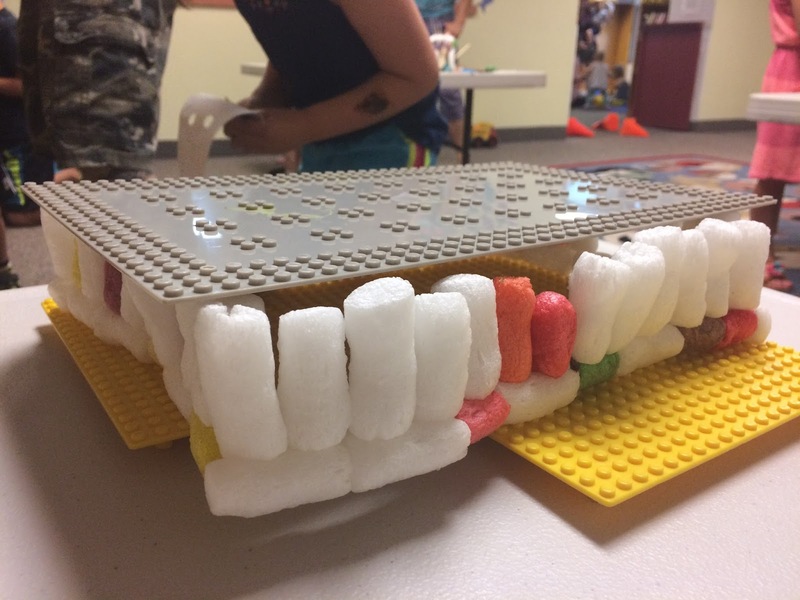 We started out by reading a version of the classic fairy tale that many of the kids were familiar with, following our three porcine protagonists through their experiments at home durability with a straw house, stick house, and finally, a brick house. After that the kids were given free rein to gather supplies and get building! 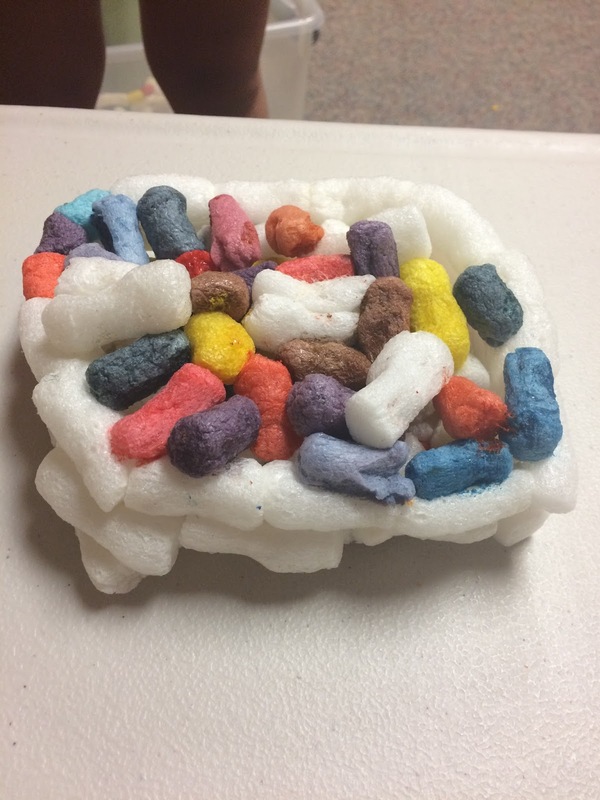 We provided Popsicle sticks, playdough, Legos, and corn-starch packing peanuts. Everyone got to work and built some great homes! Once construction was complete, the kids switched sides, coloring and cutting out a wolf mask so they could try and blow their houses down. I’m happy to report that all the residences stood strong and sturdy, despite our wolves’ best efforts! All said, there were about 15 kids who participated in the program with the help of their adult caregivers. Everyone had a blast! 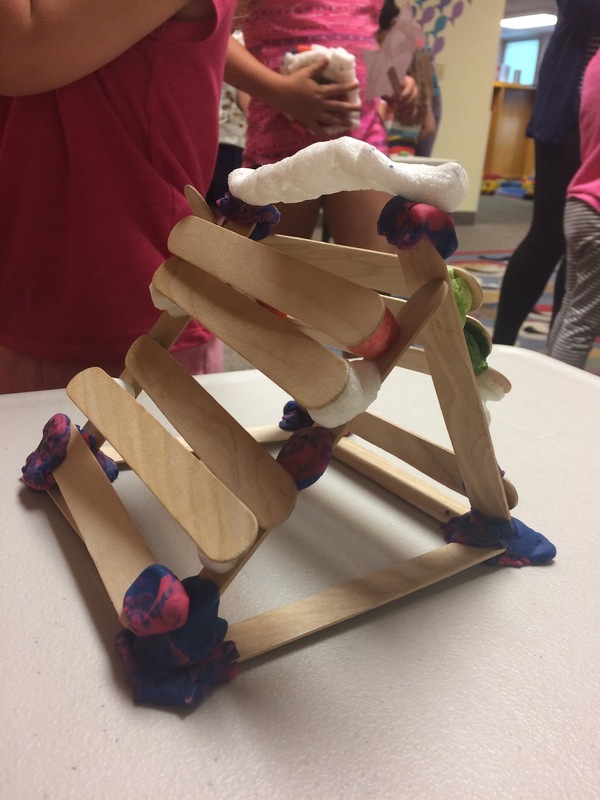 We hope to see our budding architects again on Wednesday, August 16th @ 10:30AM for our second installment of Enchanted Engineering, where we’ll help Jack build a beanstalk tall enough to reach the clouds. Take a look at some of the creations! The blog officially has a new caretaker! My name is Miss Meredith; if you or your family have visited the Children’s Room recently, you might recognize me as Miss Shannon’s smiling and bubbly assistant. Or, as one of our younger patrons noted, “the girl with the thing in her nose”. Referring, of course, to my septum piercing, which is a constant source of joy and curiosity to kids the world over. I originally started working at the Lawrence Library back in the winter of 2015, primarily on Saturday mornings with a night shift here or there. However, in the last few months I’ve taken on more hours! I now get to come in and enjoy the mornings here in the library, whether they’re quiet or hectic or somewhere in between, as well as my typical evening and Saturday shifts. I’ve never been happier! We’re also smack-dab in the middle of our Summer Reading Program. This summer our goal is get Pepperell to read 1000 BOOKS!!! Joining us in our pursuit of 1k literary conquests is easy: simply sign up on Wandoo Reader’s website and log the books you read to yourself or others. Then, at the end of the summer, join us for a celebratory ice cream party on Wednesday, August 23rd at 11:00AM. Who doesn’t love ice cream?! I’ll be posting and updating here frequently, now that I’ve been given The Power. I hope to make this a space where you, our loyal patrons, can come to get updates, craft ideas, book recommendations, literary news, and all sorts of jazz! Please feel free to leave comments here, or pop on in to say hello and let us know what you think. We value and appreciate your feedback; this library is yours as much as it is ours, and our goal has always been to work with our public to create a space for all.